Found in Europe and parts of Asia, Neanderthal lived from about 400,000 years ago until 30,000 years ago. Neanderthals were comparable in size to Homo sapien, but more robust. They also had similar brain sizes, but their skulls were shaped differently. Researchers have long wondered why Neanderthal went extinct. Some think the lack of genetic diversity made it too hard to persevere through plagues while others think that their smaller, less sophisticated social groups played a part in their demise. We do know that their stronger build would have required more food which would have been a disadvantage during hard times. In 2010, scientists from the Max Plank Institute for Evolutionary Anthropology in Germany reported that they had completed a first draft of the Neanderthal genome. This research was based on analysis of four billion DNA base pairs. Through DNA analysis, we have learned insights that had been previously unknown through only fossil evidence. Their study suggests Neanderthals had an effective population smaller than that of modern humans, and lived in small, isolated groups. And although we share about 99.7% of the same DNA, only 1-4% of modern non-African humans have inherited DNA from Neanderthals, and Africans have no common lineage. 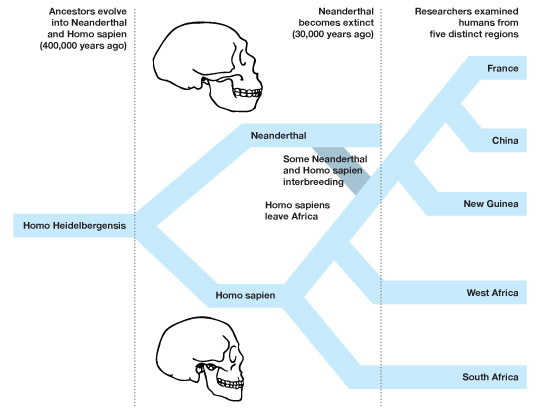 Most likely, the interbreeding occurred early in the migration of humans out of Africa. DNA analysis has also proven fruitful in a recent discovery in a cave in Northern Spain. Researchers there found the butchered remains of an extended Neanderthal family that were killed and eaten by other Neanderthals. The bones were cracked open by stone tools for marrow, suggesting that they were cannibalized before the cave collapsed and buried their remains. Researchers found that the group was genetically very similar, confirming that Neanderthals had less genetic diversity than modern humans. They also discovered through DNA analysis that they lived in small groups of males that were closely related, and that the females came from other tribes, a social system called patrilocality. Clearly, our understanding of human evolution is benefitting greatly from DNA analysis.